Is there something I can do to pass the variable by actual reference? If you pass a mutable object into a method, the method gets a reference to that same object and you can mutate it to your heart's delight, but if you rebind the reference in the method, the outer scope will know nothing about it, and after you're done, the outer reference will still point at the original object. If you pass an immutable object to a method, you still can't rebind the outer reference, and you can't even mutate the object. To make it even more clear, let's have some examples. Since the parameter passed in is a reference to outer_list, not a copy of it, we can use the mutating list methods to change it and have the changes reflected in the outer scope. Since the the_list parameter was passed by value, assigning a new list to it had no effect that the code outside the method could see. The the_list was a copy of the outer_list reference, and we had the_list point to a new list, but there was no way to change where outer_list pointed. Again, since the the_string parameter was passed by value, assigning a new string to it had no effect that the code outside the method could see. The the_string was a copy of the outer_string reference, and we had the_string point to a new string, but there was no way to change where outer_string pointed. I hope this clears things up a little. EDIT: It's been noted that this doesn't answer the question that @David originally asked, "Is there something I can do to pass the variable by actual reference?". Let's work on that. Although this seems a little cumbersome. You believe that a is a memory location that stores the value 1, then is updated to store the value 2. That's not how things work in Python. Rather, a starts as a reference to an object with the value 1, then gets reassigned as a reference to an object with the value 2. Those two objects may continue to coexist even though a doesn't refer to the first one anymore; in fact they may be shared by any number of other references within the program. self.variable is a reference to the string object 'Original'. When you call Change you create a second reference var to the object. Inside the function you reassign the reference var to a different string object 'Changed', but the reference self.variable is separate and does not change. The only way around this is to pass a mutable object. Because both references refer to the same object, any changes to the object are reflected in both places. I found the other answers rather long and complicated, so I created this simple diagram to explain the way Python treats variables and parameters. "...variables [names] are not objects; they cannot be denoted by other variables or referred to by objects." In your example, when the Change method is called--a namespace is created for it; and var becomes a name, within that namespace, for the string object 'Original'. That object then has a name in two namespaces. Next, var = 'Changed' binds var to a new string object, and thus the method's namespace forgets about 'Original'. Finally, that namespace is forgotten, and the string 'Changed' along with it. Think of stuff being passed by assignment instead of by reference/by value. That way, it is allways clear, what is happening as long as you understand what happens during normal assignment. Since immutable types cannot be modified, they seem like being passed by value - passing an int into a function means assigning the int to the functions parameter. You can only ever reassign that, but it won't change the originial variables value. Objects are allocated on the heap and pointers to them can be passed around anywhere. When you make an assignment such as x = 1000, a dictionary entry is created that maps the string "x" in the current namespace to a pointer to the integer object containing one thousand. When you update "x" with x = 2000, a new integer object is created and the dictionary is updated to point at the new object. The old one thousand object is unchanged (and may or may not be alive depending on whether anything else refers to the object). When you do a new assignment such as y = x, a new dictionary entry "y" is created that points to the same object as the entry for "x". Objects like strings and integers are immutable. This simply means that there are no methods that can change the object after it has been created. For example, once the integer object one-thousand is created, it will never change. Math is done by creating new integer objects. Objects like lists are mutable. This means that the contents of the object can be changed by anything pointing to the object. For example, x = ; y = x; x.append(10); print y will print . The empty list was created. Both "x" and "y" point to the same list. The append method mutates (updates) the list object (like adding a record to a database) and the result is visible to both "x" and "y" (just as a database update would be visible to every connection to that database). Hope that clarifies the issue for you. Technically, Python always uses pass by reference values. I am going to repeat my other answer to support my statement. Python always uses pass-by-reference values. There isn't any exception. Any variable assignment means copying the reference value. No exception. Any variable is the name bound to the reference value. Always. You can think about a reference value as the address of the target object. The address is automatically dereferenced when used. This way, working with the reference value, it seems you work directly with the target object. But there always is a reference in between, one step more to jump to the target. You can use the id() built-in function to learn what the reference value is (that is, the address of the target object). In compiled languages, a variable is a memory space that is able to capture the value of the type. In Python, a variable is a name (captured internally as a string) bound to the reference variable that holds the reference value to the target object. The name of the variable is the key in the internal dictionary, the value part of that dictionary item stores the reference value to the target. Reference values are hidden in Python. There isn't any explicit user type for storing the reference value. However, you can use a list element (or element in any other suitable container type) as the reference variable, because all containers do store the elements also as references to the target objects. In other words, elements are actually not contained inside the container -- only the references to elements are. I think it is important to note that the current post with the most votes (by Blair Conrad), while being correct with respect to its result, is misleading and is borderline incorrect based on its definitions. While there are many languages (like C) that allow the user to either pass by reference or pass by value, Python is not one of them. David Cournapeau's answer points to the real answer and explains why the behavior in Blair Conrad's post seems to be correct while the definitions are not. To the extent that Python is pass by value, all languages are pass by value since some piece of data (be it a "value" or a "reference") must be sent. However, that does not mean that Python is pass by value in the sense that a C programmer would think of it. If you want the behavior, Blair Conrad's answer is fine. But if you want to know the nuts and bolts of why Python is neither pass by value or pass by reference, read David Cournapeau's answer. The key to understanding parameter passing is to stop thinking about "variables". There are names and objects in Python and together they appear like variables, but it is useful to always distinguish the three. Python has names and objects. Assignment binds a name to an object. Passing an argument into a function also binds a name (the parameter name of the function) to an object. That is all there is to it. Mutability is irrelevant for this question. This binds the name a to an object of type integer that holds the value 1. This binds the name b to the same object that the name x is currently bound to. Afterwards, the name b has nothing to do with the name x any more. See sections 3.1 and 4.2 in the Python 3 language reference. 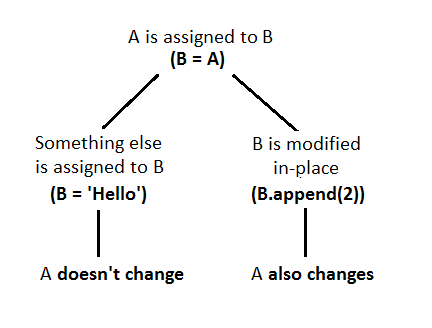 So in the code shown in the question, the statement self.Change(self.variable) binds the name var (in the scope of function Change) to the object that holds the value 'Original' and the assignment var = 'Changed' (in the body of function Change) assigns that same name again: to some other object (that happens to hold a string as well but could have been something else entirely). You got some really good answers here. I'm sure someone else could clarify this further. Immutable arguments are effectively passed “by value.” Objects such as integers and strings are passed by object reference instead of by copying, but because you can’t change immutable objects in place anyhow, the effect is much like making a copy. Mutable arguments are effectively passed “by pointer.” Objects such as lists and dictionaries are also passed by object reference, which is similar to the way C passes arrays as pointers—mutable objects can be changed in place in the function, much like C arrays. As you can state you need to have a mutable object, but let me suggest you to check over the global variables as they can help you or even solve this kind of issue! "In Python, variables that are only referenced inside a function are implicitly global. If a variable is assigned a new value anywhere within the function’s body, it’s assumed to be a local. If a variable is ever assigned a new value inside the function, the variable is implicitly local, and you need to explicitly declare it as ‘global’. Though a bit surprising at first, a moment’s consideration explains this. On one hand, requiring global for assigned variables provides a bar against unintended side-effects. On the other hand, if global was required for all global references, you’d be using global all the time. You’d have to declare as global every reference to a built-in function or to a component of an imported module. This clutter would defeat the usefulness of the global declaration for identifying side-effects." Even when passing a mutable object to a function this still applies. And to me clearly explains the reason for the difference in behavior between assigning to the object and operating on the object in the function. The assignment to an global variable that is not declared global therefore creates a new local object and breaks the link to the original object. 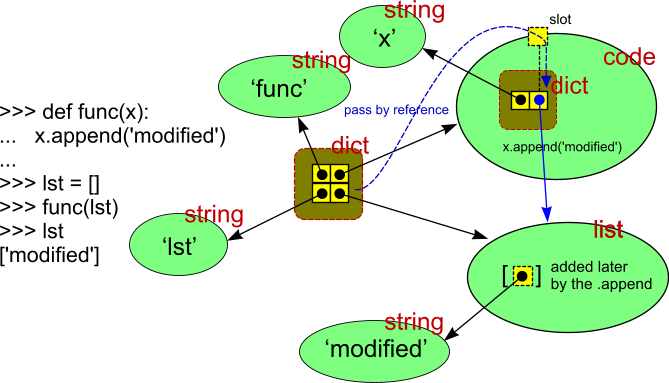 Here is the simple (I hope) explanation of the concept pass by object used in Python. which obviously will change the object. This answer explains it well. In instance methods, you normally refer to self to access instance attributes. It is normal to set instance attributes in __init__ and read or change them in instance methods. That is also why you pass self als the first argument to def Change. I used the following method to quickly convert a couple of Fortran codes to Python. True, it's not pass by reference as the original question was posed, but is a simple work around in some cases. While pass by reference is nothing that fits well into python and should be rarely used there are some workarounds that actually can work to get the object currently assigned to a local variable or even reassign a local variable from inside of a called function. The basic idea is to have a function that can do that access and can be passed as object into other functions or stored in a class. One way is to use global (for global variables) or nonlocal (for local variables in a function) in a wrapper function. The same idea works for reading and deleting a variable. For just reading there is even a shorter way of just using lambda: x which returns a callable that when called returns the current value of x. This is somewhat like "call by name" used in languages in the distant past. Here the ByRef class wraps a dictionary access. So attribute access to wrapped is translated to a item access in the passed dictionary. By passing the result of the builtin locals and the name of a local variable this ends up accessing a local variable. The python documentation as of 3.5 advises that changing the dictionary might not work but it seems to work for me. in real code you would, of course, add error checking on the dict lookup. Pass-By-Reference in Python is quite different from the concept of pass by reference in C++/Java. Java: Everything is passed by reference so all changes made in the parameter in the called function are visible to the caller. C++: Both pass-by-reference or pass-by-value are allowed. If a parameter is passed by reference, you can either modify it or not depending upon whether the parameter was passed as const or not. However, const or not, the parameter maintains the reference to the object and reference cannot be assigned to point to a different object within the called function. Python: Python is “pass-by-object-reference”, of which it is often said: “Object references are passed by value.”[Read here]1. Both the caller and the function refer to the same object but the parameter in the function is a new variable which is just holding a copy of the object in the caller. Like C++, a parameter can be either modified or not in function - This depends upon the type of object passed. eg; An immutable object type cannot be modified in the called function whereas a mutable object can be either updated or re-initialized. A crucial difference between updating or re-assigning/re-initializing the mutable variable is that updated value gets reflected back in the called function whereas the reinitialized value does not. Scope of any assignment of new object to a mutable variable is local to the function in the python. Examples provided by @blair-conrad are great to understand this. You can merely use an empty class as an instance to store reference objects because internally object attributes are stored in an instance dictionary. See the example. "A class which helps to create references to variables." Not the answer you're looking for? Browse other questions tagged python reference parameter-passing pass-by-reference or ask your own question. Python : When is a variable passed by reference and when by value? Without pointers, can I pass references as arguments in Python? Why do list operations in python operate outside of the function scope?